Around 220 BC, the dynasty was founded by Qin Shi Huang, the First Emperor of Qin; his reign marked the end of feudalism. Shi Huang succeeded in establishing peace, unifying the kingdom and laying the foundations for a centralized government. He is particularly known for having introduced a range of reforms, establishing a grid of salaries for civil servants - a system which still applies nowadays – standardizing the currency, weights and measures, initiating the construction of the Great Wall, and building during his lifetime a mausoleum, which was later on known as the Terracotta Army. It was the first dynasty to rally Confucian wises and to confer ideological legitimacy to power. 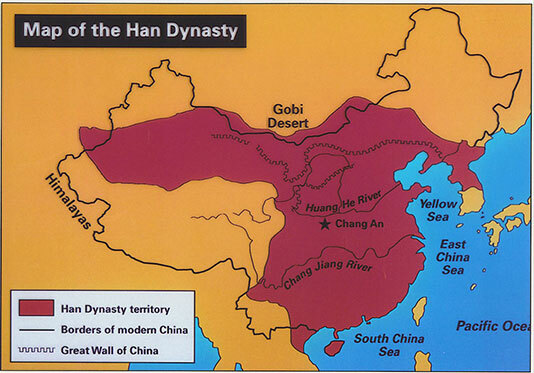 The Han organized a powerful and highly centralized state, expanded the empire, increased defensive protections – built the Great Wall, watchtowers, armed detachments - and opened the Silk Road to allow trade with India and the Roman Empire. Indian travellers and traders started introducing Buddhism. 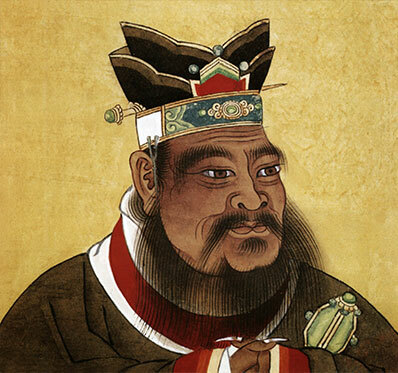 The emperor Wu of Han (156 BC- 87 BC), seventh emperor coming from the Han Dynasty, is considered, along with the emperors Tang Taizong (Tang Dynasty) and Kangxi (Qing Dynasty) as one of the greatest emperors in the history of China. Confucius was born in 551 BC. His teachings gave birth to Confucianism, a political and social doctrine erected as a state religion under the Han dynasty. When the perfect order reigns, the universe is like a home, shared by everyone. The virtuous and dignified man is elected to public office, and the capable man holds a lucrative job in society. Peace and trust among men are the rules of life. Everyone loves and respects their own parents and children, as well as the parents and children of others. Every man and woman have a role to play within the family and society. 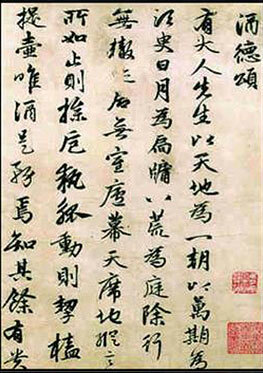 Under the Han, developments in paper led to a boom in writing and calligraphy got an official artistic status. Paradoxically, valuable clues about our current knowledge of the Han has not been revealed through written documents, but through funerary artwork. 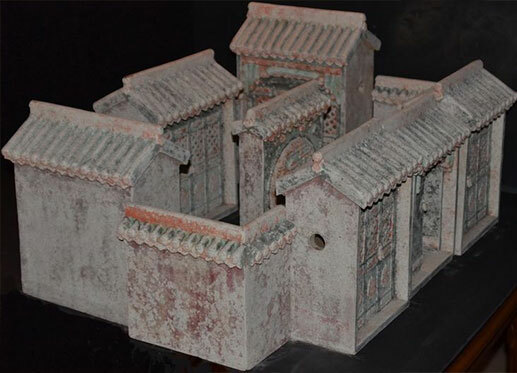 Nothing remained of the architecture from the Han Dynasty: no cities, nor palaces. For Chinese people, the eternity of the soul is conditioned by the permanence of the body. This is why burials were more strongly built than palaces. Funerary art tells us precisely about the refined world of rich dwellings, as well as about the lifestyle of the elite. We can be sure that funerary art was very important during the Han Dinasty. The Han dynasty maintained a civil service system by recruiting scholar-officials through standardized examinations and recommendations to office. These scholar-officials, also known as the literati, were schooled in calligraphy and Confucian texts which were the conditions to access to power. The learning processes, the respect of the masters in the art of writing and of argumentation, were the essential qualities to the success of a civil servant's career. In this context, writing helped to account for the special status conferred upon those who could read and write and benefited from a social, intellectual and artistic prestige of the first order. Calligraphy can be defined as a type of graphic expression, oriented and defined by power and for power. Calligraphy, in particular used at the court, was considered as being the noblest art. The four treasures of the literate are the brush, the ink stick, the inkstone and the paper. Through their decor and furnishings, tombs became a dwelling which reflected the social status of the deceased. Those of the beginning of the dynasty were looking for the utmost search of the most extravagant luxury. Confucian scholars expressed a virulent criticism towards luxurious burials and forced the government to regulate funerary practices in order to avoid any excesses and rivalries. Also found inside tombs were ritual jade, precious metal and bronze artifacts, which were then often replaced by wooden or terracotta figurines - called mingqi - and human sacrifices were definitively banished according to Confucian principles of moderation and respect for life. From ancient China until the beginning of the Fighting Kingdoms, sacrificial pits could contain up to 1,200 bodies, i.e. servants, guards, prisoners of war, horses, dogs who "had the honour" to accompany the deceased into afterlife. The necropolises of the elite were composed of complex tombs, with important funerary goods intended to accompany the deceased in the afterlife. Under the Western Han. 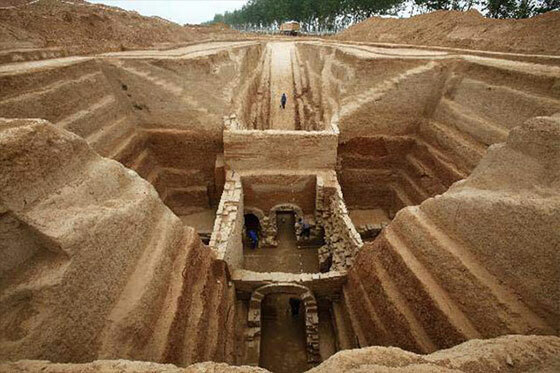 The Western Han rulers were being buried in tombs located under huge mounds of compacted earth. The complex in itself was conceived as a symbolic replica of the imperial town, surrounded by a square enclosure with doors with pillars. The temple for funeral rites was built nearby, as well as many wells containing goods. In order to get to the tombs, there was a monumental processional way, the so-called “spirit path”, flanked by trees and huge statues of men, animals and mythological figures. Under the Eastern Han. 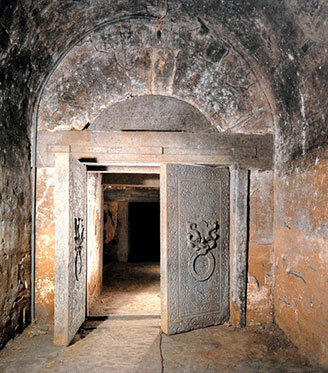 During the Eastern Han, so-called underground palace tombs were introduced. The vertical wells appeared to be hermetically sealed from the outside, evolved towards horizontal tombs. They were accessible by a ramp, leading to underground chambers generally arranged in an axial way, and separated by stone doors. The tombs were smaller and not as luxurious as under the Western Han. Collective graves were also introduced to house the coffins of the same family members. 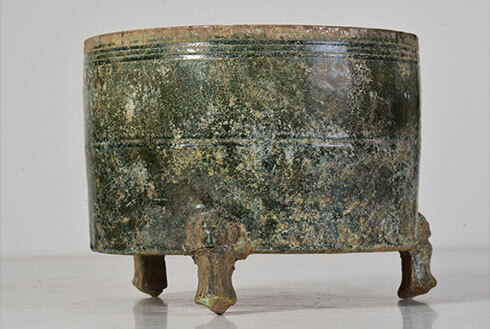 Most art objects from the Han dynasty period came from funerary furnishings. 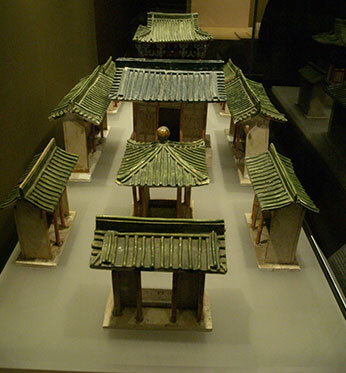 Since the Warring States period, burial figures in the tombs, have been divided between those wares and pieces of art that had been used by the tomb occupant during life (shengqi) and those stylistic goods, wares and artwork found in tombs which were usually made exclusively for burial (mingqi). They were linked to the belief in a parallel world to ours, from which the ancestors, if honoured, could intercede for the benefit of their descendants. These objects had a protective function, but also served as cosmological symbols. It is through the examination of these reduced models that we learned about the lifestyle of the elite and got valuable details about their mansions, towers, agricultural facilities or rural estates. 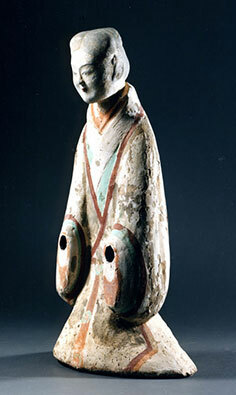 Under the Eastern Han, models were most often made of glazed ceramic, with a grey-green or black lead glaze. Mingqi are Chinese burial goods. They included figurines, spiritual representations of servants, musicians, acrobats, dancers and courtesans, but also of animals. The highest dignitaries and especially the sovereigns were accompanied by real miniature armies, consisting of hundreds or even thousands of figurines. One of the most impressive examples is undoubtedly the life-sized terracotta of Qin Shi Huang, the first Emperor of China during the Qin Dynasty. Under the Han, the pits from the tomb of Emperor Jing in Yangling, revealed an army of soldiers. Compared with the Qin Terra Cotta Warriors and Horses, the miniature version of pottery figures was one tenth of the actual objects. They were often insignia/signs of power and denoted rank and status. Highest ranking nobles were also buried with attributes related to their function such as insignia, seals and swords. 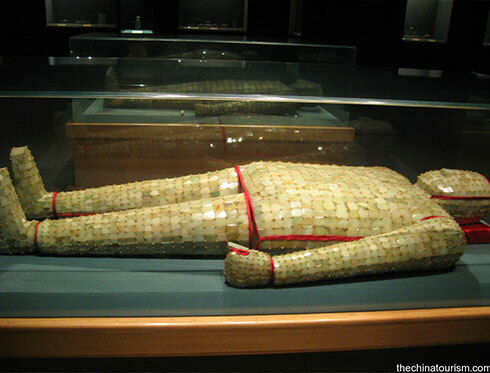 Perhaps the most remarkable example of jade art of the Han Dynasty were the custom-made jade suits, stitched together using gold wire, designed to enclose the bodies of some members of the imperial family and protect them against evil spirits in the afterlife. Jade was especially esteemed for its rarity, durability, purity, and certain mystical qualities and fairly used in the elites’ tombs, most often sewn on their funerary clothes. Bi discs, cong, zoomorphic sculptures, which already existed in archaic tombs were further appreciated. These objects were decorated with symbolic and magical animals, such as the dragon and phoenix motifs and were supposed to guide the person's spirit to heaven. The tiger was a symbol of protection while the cicadas placed in the mouth of the deceased, believed to effectively preserve the body after death. 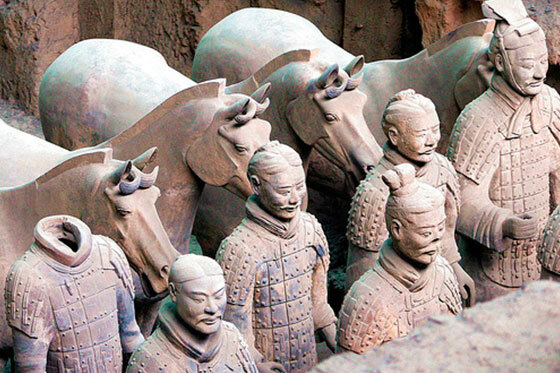 Horses were not only a vital part of China’s military force but were associated with myths and representations of life in the afterlife. The Chinese funerary iconography, which during a long time had been dominated by mythical animals made of chimeras, tigers, dragons or phoenixes, began to evolve towards more realistic subjects. 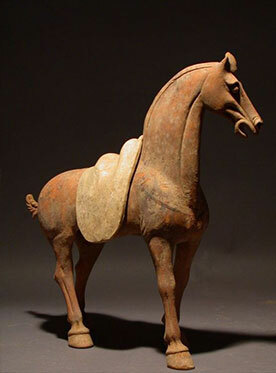 As horses were important to Han rulers and aristocrats, and definitively were an indicator of a social status, equine representations increased. While under the Western Han, horses were seen as a sign of strength, vitality, speed and nobility, they were represented as being impetuous, dashing and racing under the Eastern Han. 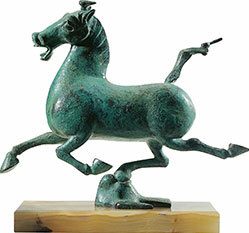 The extraordinary "flying horse" - which often accompanied high dignitaries in their tombs - became a metaphor, while naturalism remained secondary. Horses which had often been idealized and stylized were represented with pricked ears, concave chamfer and bulging eyes. The head was facing forward and their open mouth revealed the horse’s teeth. The incense burners made of jade or sometimes of bronze enhanced with gold, with decorative arabesques evoked immortal mountains, dragons or impassable waves. Mirrors in the tombs from the second century onwards are still a clue for archaeologists. Were they intended to ensure harmony between man and cosmos ? Among daily objects, some rare embroidered or painted silk pieces, such as clothes, funeral banners and cards were found. They give us a glimpse of the refinement of this fibre, which was already being exported. Hitherto, decorations which consisted in paintings or bas-reliefs were limited to the coffin and the banner covering it. From the first century BC onwards, decorations were painted on the walls of the tombs. Decorations consisting in mythical animals, deities and protective symbols were designed to ensure that the deceased would be integrated in the cosmos. 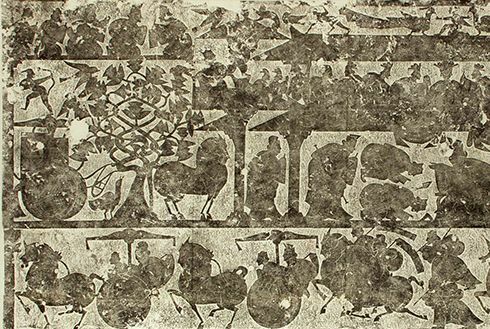 Some scenes from everyday life illustrated the Confucian ideal, of which the family of the deceased was attached to: banquets, ceremonies, hunting, fishing, agriculture. The paintings were also depicting historical events.